Shake things up with Zija's SmartMix, an easy-to-open packet that you can add to water for a dose of pure Moringa nutrition – even on the go! 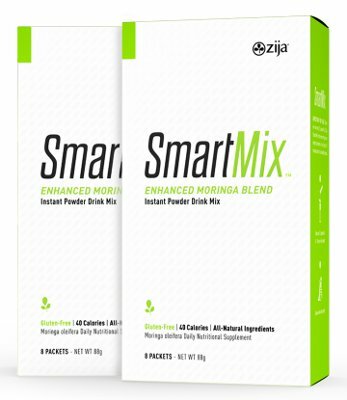 Zija SmartMix - Drink Life In! 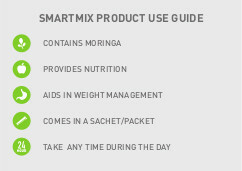 SmartMix is packed with Moringa Oleifera, Chicory Root, and FoTi Root so it is overflowing with cell-ready nutrients, prebiotics, antioxidants, minerals, omega oils and vital proteins. 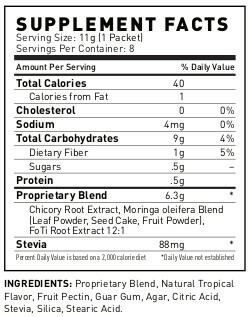 Moringa's natural benefits include anti-inflammatory support, heightened mental clarity, increased energy, anti-aging, and improved circulation. Chicory Root Extract, derived from the herbaceous Chicory plant, contains inulin, a prebiotic that provides a feeling of fullness and stimulates healthy digestive function. FoTi Root Extract has been used for thousands of years in Chinese medicine to increase vitality and mood. It also helps remove toxins from the body. Zija SmartMix Nutritionals Natural, gluten-free and contains over 90 nutrients and benefits in each serving. Drink one serving of Zija Smart Mix any time of day on an empty stomach (preferably 15 minutes prior to a healthy breakfast).